At the height (or depth) of the disco fad in late 1977, the Tennessee Valley Authority (TVA) shut down the Unit 1 reactor at its Browns Ferry Nuclear Plant in Alabama to begin a refueling outage. Workers removed the top head of the reactor vessel to remove irradiated fuel assemblies and replace them with new fuel assemblies. In January 1978, the unthinkable happened – a rubber overshoe fell into the reactor water. 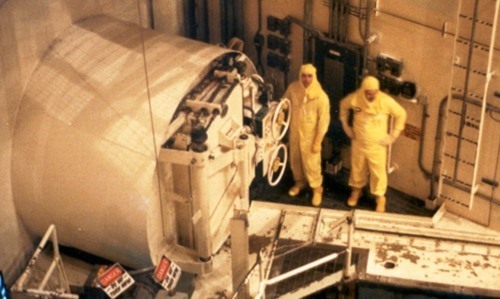 The figure above shows two workers wearing protective clothing, including rubber overshoes, inside containment at a nuclear power plant. The bad news: the rubber overshoe could not be found. The good news: no one was wearing the overshoe when it entered the water. The overshoe, also called a rubber booty, was worn along with protective clothing to keep workers from getting contaminated with radioactive material and tracking contamination throughout the plant. When an intensive search failed to find it, TVA examined restarting the plant with the booty still inside the reactor vessel. It turned out that the booty could conceivably block cooling water flow through a fuel assembly, causing that fuel assembly to overheat. However, tests conducted by General Electric showed that high temperature would cause the booty to dissolve if the reactor operated at very low power for 24 hours. TVA tried it and it worked. The booty adventure caused the Unit 1 refueling outage to be extended 17 days. TVA estimated the replacement power costs for that period to be $9.7 million. Rather expensive footwear! Events such as this one resulted in significant upgrades in FME – foreign material exclusion – controls. Booties are taped securely to protective clothing legging, both to seal against radioactive material getting in and to prevent loose footwear from inadvertently getting into undesired places. Even eyeglasses are worn on lanyards around workers’ necks to prevent them from slipping away to parts unwanted. Such events illustrate the need to consider the intended and unintended aspects of planned activities. The booties were used for the intended function of protecting against radiological contamination. One booty’s mis-use had the unintended function of threatening adequate cooling of fuel in the reactor core. Measures subsequently adopted to securely fasten booties allowed the intended function to be achieved while significantly reducing the risk from the unintended function.